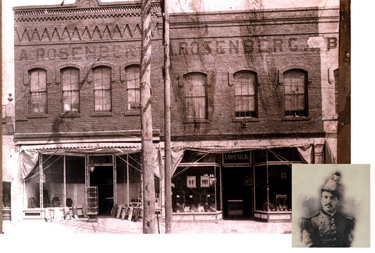 In the fall of 1884, Abraham Rosenberg moved to Greenwood, South Carolina, population 500, and opened a clothing and shoe store. He had arrived in South Carolina from Poland in 1875, and worked in Abbeville in a cousin’s store, and later in Camden, before going into business for himself. As a member of Kershaw’s Guard of the South Carolina Militia, an interracial company, Rosenberg had won the pompom hat for best-drilled soldier.